Around here, 'tonic' was often used to describe what most people call 'pop', 'soda' or 'soda pop', but it seems to have died off since about the '80s. I'll never understand the "Coke" thing. There's a lot I don't understand about the South. I'm a soda guy from Eastern PA living in the pop region of Western PA. I thought you meant regional-only beverages - Mr. Pibb, RC Cola, Moxie, etc. I'm 57 years old, and I've lived in Ohio all but 3 years. I've never heard "pop" referred to as "medicine." For that matter, when I lived in Okla, I never heard it called "sugar oil" either. I would say the graphic is suspect. Growing up in NYC, it was always "soda". When I got to Madison in 1971 it was "pop" (I actually didn't know what it was the first time I heard it used). 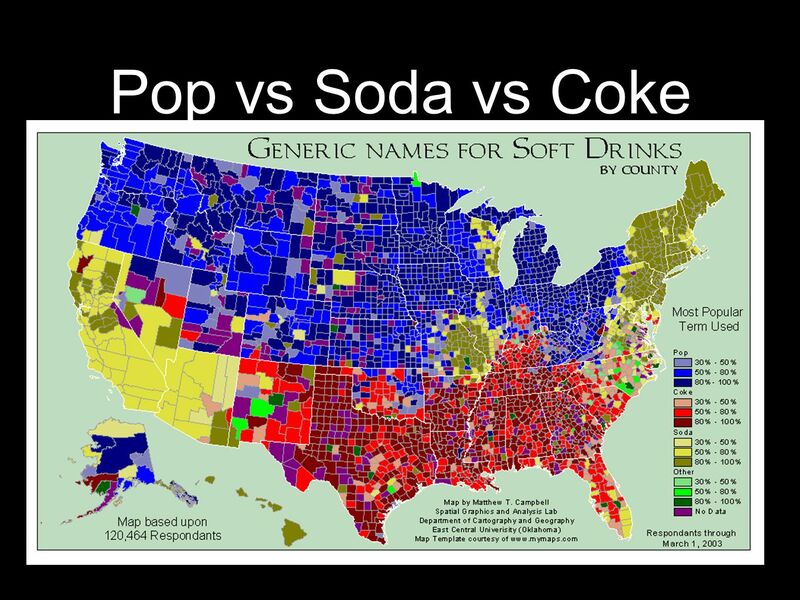 Over the last 48 years I hear "pop" less & less and "soda" more & more in WI. I'm sure that social media has contributed heavily to the migration of terms. In Michigan, it's called "pop". My relatives in Texas refer to anything that's carbonated as "coke". The OP's graph is fraudulent or facetious. Yeah, it's not (that) serious. I used to live where we called it soda pop, or by the brand name. Now I just don't drink it. I might move to where they call it Ichor, or Fizz Ooze. Just so you know, Randall Munroe, who draws the XKCD comic seen in the OP, is pulling your leg. Few, if any, of the names he came up with are used anywhere in the country. Regional terms do exist, but they are not as wild as those shown on his map. Soda is something you make with ice cream and pop. Naw, that's an ice cream soda. Here it is "pop" . Soda is something you make with ice cream and pop. "Pop" is what the weasel does. Yeah. I'm squarely in the soda belt, but I get pop, too. Using 'Coke' for any carbonated beverage is just dumb. Also, lol Alaska, what are you doing?! That would be a Jimmy Buffett reference applied to the wrong beverage. There was a time when pop was good music. I grew up in Rhode lsland and it was always "soda." For several summers we went to sleep-away camp in northeastern New Hampshire. Up there it was "tonic" (pronounced "tawnic"). The New York and southwestern Connecticut kids at camp called it "pop." Of course, in Rhode Island we had weird names for everything. An Italian sub sandwich ("sangwich") was a "grinder" while all others were "subs." A milk shake with ice cream was a "cabinet." Some called pancakes "johnny cakes." And the Weasel didn't only pop, he posted on PE. No, it was pronounced "tonic". We might have a funny accent to most people, but the "ō" sound is not among them. I've noticed a lot of people from CT & SW MA say something like "pahp". Some called pancakes "johnny cakes." Nor I. When I was a kid, we went to South Carolina on a holiday, and stopped at a restaurant, where I asked for a Coke. The waitress said "What kind?"... and I was temporarily at a loss for words as to what that question could possibly mean. Ummm... the dark, fizzy, sugary kind that comes in a red-and-white can or bottle? Here it is called pop. I've heard it called soda in enough TV shows and movies that it doesn't really faze me though. But to me, soda is the carbonated water that a bartender adds to a cocktail. I love coke, in a bottle. We call them Soft Drinks around these woods. We call them that too, but I think pop is the most common term. It has a lot to do with the Coca-Cola Corporation's hq being in Jawja.